I liked it, but I thought it could use some color, so I hacked a crude version in GIMP and sent it to Mark with a, “Hey, please put this on a t-shirt so I can throw money at you” plea. Lo and behold, he did just that. You can get your own from Mark’s Zazzle store. And apparently he will have more sauropod-themed merch coming soon. Good to see the necks all nicely near vertical. I have determined that in order to drink water without their proximal-most cervical vertebra buckling, they had to drink very carefully. Let us imagine happening upon a trio of Alasmosaurus perched at water’s edge on their tails and heels like three-legged stools, thumb-claws scratching their hips, heads plunged vertically into the water like elephants’ trunks. Before you object, you tell me what all that ventral caudal musculature was for, if not to tip them back upright, afterward. I assume you’re joking, but for the benefit of any newcomers: sauropods and most other non-avian dinosaurs had big tails in part because of the caudofemoralis muscle, which provided most of the power stroke for the hindlimb in walking and running. Most mammals have dinky tails because we shifted our femur-retracting muscles from our tails to our hips. For more about the caudofemoralis, check out this great post on dinosaur butts. – push forward forcefully, which might have been useful in dominance contests or for shoving trees over. Probably some others I haven’t thought of. 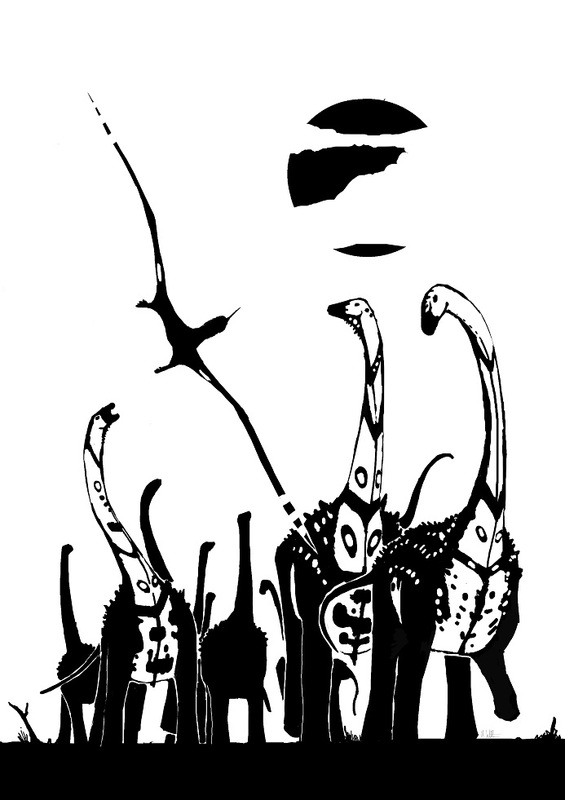 No, let’s not have any hippy sauropods that look like they are about to break into a rendition of I Am The Walrus brachiating among the trees. That would be too much. 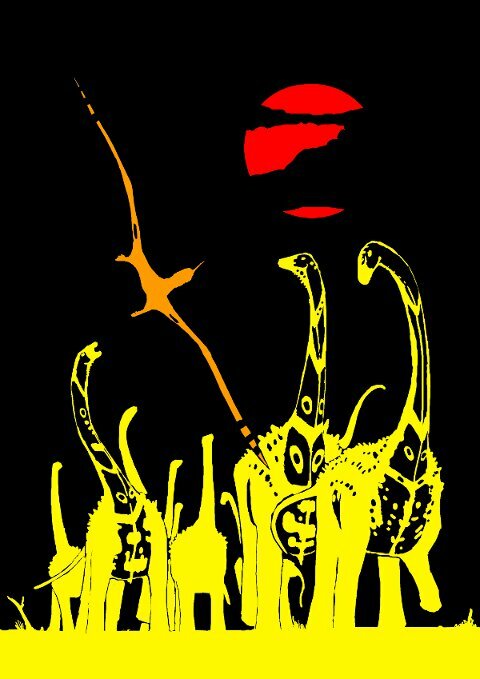 I think the black-and-white version has more impact, maybe because the colors draw attention away from the sauropods. I agree. Black on a red shirt would be perfect. Well, suggest it to Mark. I don’t know if he’ll make a shirt for every suggested variation, but (1) he might, and (2) at worst he might want you to gin up some support before he goes to the trouble. « Brian Engh: Stomp time!